Electrical under floor heating is not new. What is new is the level of comfort, flexibility of installation and controllability offered by the systems adopted by Delta ‘T’. Our range of products offers systems suitable for direct installation under most floor types (tile, wood, laminate and carpet). Equally the system can be installed directly onto all types of sub floor (wooden, plaster or concrete). 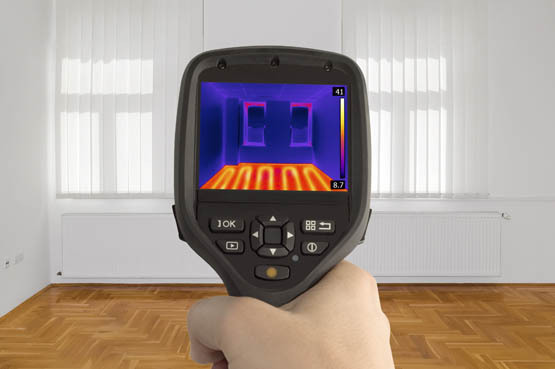 For new construction or renovation, you can attain a level of comfort heating that is safe (no hot surfaces to touch), ‘invisible’, (no intrusive radiators) and energy efficient (uniform distribution of heat at floor level, where it is needed). Self regulating cable systems are able to “sense” other sources of heat such as solar radiation, electrical appliances and lighting and automatically adjust its output accordingly. There is NO risk of overheating which gives unlimited flexibility for moving furniture around. Our range of ‘constant output’ products provide a small profile underfloor heating system, that can be installed directly under floor tiles, in areas where limited installation depths are critical. A range of room and floor sensing temperature controls are available to insure a system ‘tailored’ to the specific requirements of the dwelling.